An international agreement that has been instrumental in repressing piracy and armed robbery against ships in the western Indian Ocean and the Gulf of Aden is set to significantly broaden its scope. Signatories to the Djibouti Code of Conduct have agreed to work towards extending its remit to address other illicit maritime activity that threatens safety and security in the region, such as marine terrorism, environmental crimes, human trafficking and Illegal, unreported and unregulated fishing. National focal points for the code, which was adopted under the auspices of the IMO in 2009, have adopted a resolution expressing concern at the increasing risks from transnational organized crimes at sea and other threats to maritime safety and security in the region. They agreed to encourage information sharing on all illicit activities at sea. Training and other capacity-building activities implemented under the auspices of the Djibouti Code of Conduct have been credited with contributing to the reduction of piracy in the Western Indian Ocean and the Gulf of Aden, alongside the efforts of merchant ships to implement IMO guidance and best management practices, naval forces continuing to deter and disrupt pirate activities and States continuing to prosecute suspected pirates and increasing their maritime law-enforcement capabilities. But the focal points recognized that piracy in the region has merely been suppressed and its root causes have yet to be addressed. They agreed that, nonetheless, there is now a window of opportunity for IMO Member States in the region to implement capacity-building programmes to prevent a resurgence of piracy and to address wider maritime security issues, as a basis for sustainable development of the maritime sector. The focal points were meeting this week (11-12 November) in the newly-completed Djibouti Regional Training Centre, which was formally opened by Mr. Moussa Ahmed Hassan, Djibouti's Minister of Equipment and Transport, on Thursday 12 November. The Djibouti Regional Training Centre will play a key role in regional capacity-building initiatives under the Code of Conduct. 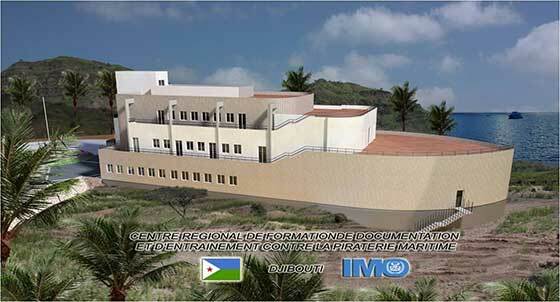 IMO Secretary-General Koji Sekimizu, speaking by video message during the ceremony, encouraged the Government of Djibouti to be imaginative in its use of the new building and to be proactive in maximizing its potential, for the benefit of the whole region. The centre could be used as a venue for wider port, maritime, law-enforcement or indeed any other training, conferences and meetings, as well as being a centre of excellence for regional maritime security training, he said. "This impressive new centre will be a vital component in the provision of maritime security and other training in the Gulf of Aden and Western Indian Ocean area and fully supports IMO's 2015 World Maritime Day theme: "Maritime education and training". It should be an asset to Djibouti and to the region for many years to come," Mr. Sekimizu said. The national focal points meeting also approved the 2016 plan for regional training for Djibouti Code of Conduct countries. Construction of the Djibouti Regional Training Centre was funded by Japan, through the Djibouti Code Trust Fund, with equipment provided by Denmark and the Republic of Korea. IMO continues to support Member States to implement the Djibouti Code of Conduct through its Integrated Technical Cooperation Programme (ITCP) and through the Djibouti Code Trust Fund. It also maintains a presence in the region, focussed on the code, with two staff members based in Nairobi, Kenya, whose primary role is training. The opening ceremony was also attended by Mr. Chris Trelawny, Special Adviser to the IMO Secretary-General; His Excellency Tatsuo Arai, Ambassador of Japan to the Republic of Djibouti; His Excellency Joseph Silva, European Union Ambassador to Djibouti, Mr. Hassan Darar Houffaneh, Minister of Defence of Djibouti; Mr. Ali Mirah Chehem Daoud, Director of Maritime Affairs of Djibouti; Ms. Mina Houssein Doualeh, Director of the Djibouti Regional Training Centre; as well as senior government officials from Djibouti. Also present was Ambassador Nur Farah Hersi , Minister, Somali Federal Government, Ministry of Ports and Marine Transport as well as other representatives from Djibouti Code of Conduct signatories, donor countries and international training partners. The Code of Conduct concerning the Repression of Piracy and Armed Robbery against Ships in the Western Indian Ocean and the Gulf of Aden (the Djibouti Code of Conduct) provides a framework for capacity building in the Gulf of Aden and Western Indian Ocean to counter the threat of piracy. The Code was signed on 29 January 2009 by the representatives of: Djibouti, Ethiopia, Kenya, Madagascar, Maldives, Seychelles, Somalia, the United Republic of Tanzania and Yemen. Comoros, Egypt, Eritrea, Jordan, Mauritius, Mozambique, Oman, Saudi Arabia, South Africa, Sudan and the United Arab Emirates have since signed, bringing the total to 20 countries. Since its adoption, the Code has become the major focus for facilitating transnational communication, coordination and cooperation in its four thematic broad pillars: delivering national and regional training, enhancing national legislation, information sharing and building counter-piracy capacity. The Djibouti Meeting adopted the Code of Conduct concerning the Repression of Piracy and Armed Robbery against Ships in the Western Indian Ocean and the Gulf of Aden, which was signed on 29 January 2009 by the representatives of Djibouti, Ethiopia, Kenya, Madagascar, Maldives, Seychelles, Somalia, the United Republic of Tanzania and Yemen. It remains open for signature at IMO Headquarters by other countries in the region. 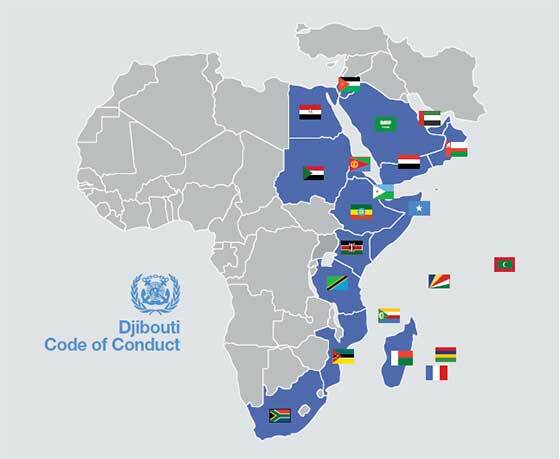 Comoros, Egypt, Eritrea, Jordan, Mauritius, Mozambique, Oman, Saudi Arabia, South Africa, Sudan and the United Arab Emirates have since signed making the current total 20 countries from the 21 eligible to sign the Djibouti Code of Conduct. (d) the conduct of shared operations - both among signatory States and with navies from countries outside the region - such as nominating law enforcement or other authorized officials to embark on patrol ships or aircraft of another signatory. In addition, the Code provides for sharing of related information, through a number of centres and national focal points using existing infrastructures and arrangements for ship to shore to ship communications (i.e. the Regional Maritime Rescue Coordination Centre in Mombasa, Kenya and the Rescue Coordination Sub-Centre in Dar es Salaam, United Republic of Tanzania) and the regional maritime information centre, which is being established in Sana'a, Yemen. In another resolution the Meeting requested States, IMO, the United Nations Development Programme (UNDP), the United Nations Office on Drugs and Crime (UNODC), the European Commission (EC), the Regional Co-operation Agreement on Combating Piracy and Robbery Against Ships in Asia - Information Sharing Centre (ReCAAP-ISC) and the maritime industry to provide assistance, either directly or through IMO, to those States, which require support in the effective implementation of the Djibouti Code of Conduct. It further recommended the establishment of a regional training centre for the purposes of promoting the implementation of the Code and accepted, with appreciation, the offer of the Government of Djibouti to host a regional training centre within the scope of the Code.